I've written a few times about the various alcohol delivery services in our area -- Klink, Drizly and Ultra. Klink has offered some cool deals in the past, like free boozy cupcakes, and just in time for Halloween, here's another -- s'mores burritos. 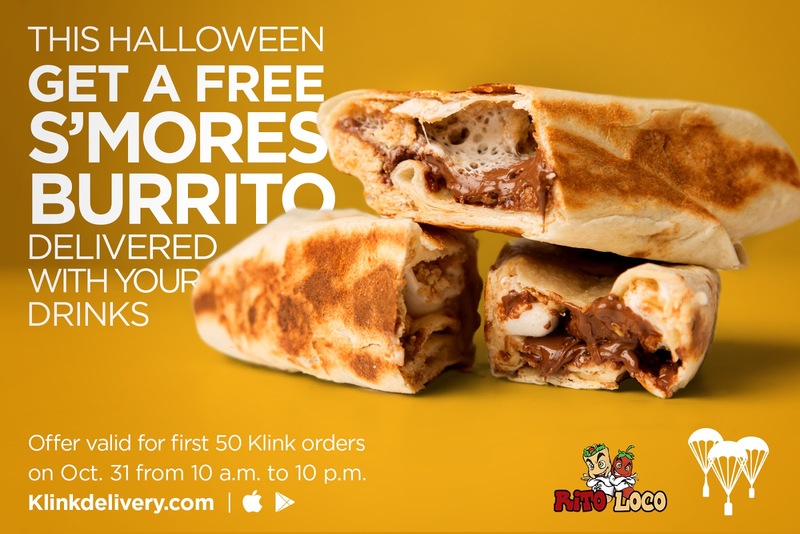 WASHINGTON, D.C. — Klink, the app-based service for on-demand beer, wine and spirits delivery has partnered with local burrito hot spot Rito Loco to give away free s’mores burritos this Halloween. Rito Loco is a fusion burrito company based in the Shaw area that creates recipes that are unique to the traditional Mexican-style burritos. 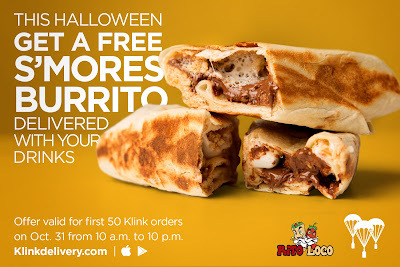 “Our dessert burritos are truly a treat, which is why partnering with Klink this Halloween is such a perfect fit. When people try our S’mores Rito or our Fruit Rito, they often say it’s one of the best things they have ever eaten. Together, we can deliver something sweet to Klink’s customers without anyone needing to leave the house,” says Shane duNann, Rito Loco’s Marketing Director. Having first paved the way for alcohol delivery in D.C. more than a year ago, Klink is changing the way people purchase their beer, wine and spirits. Klink currently delivers to all of Washington D.C.
Here’s how it works: Customers can access Klink’s website at klinkdelivery.com or download the Klink Delivery app from the App Store or Google Play. One Rito Loco s’mores burrito will be included in the first 50 orders placed Saturday. Klink offers an app (iOS | Android) and website (klinkdelivery.com) through which customers can order beer, wine and spirits to their doorstep in less than an hour. The app services Washington, D.C.; Miami, FL; Dallas, TX . Customers pay only $3.87 for delivery, with no markups and a $20. The delivery fee is normally $3.87 but it will be waived this halloween using the promo code “Treat”. 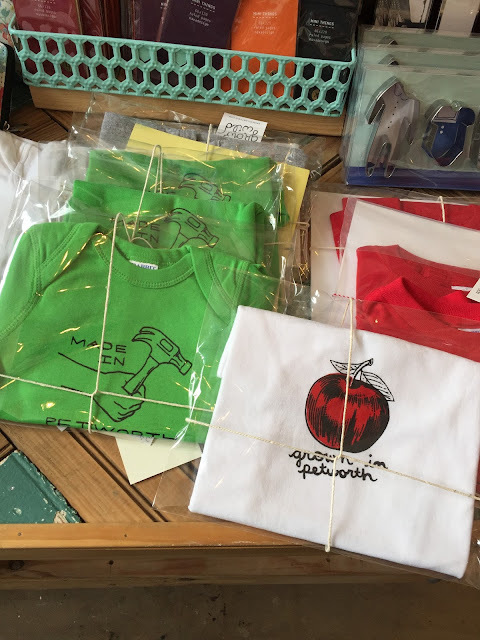 The other day I was exploring the Upshur Street strip and decided to pop in Willow, the newish gift shop and clothing boutique next to Petworth Citizen. And it's a pretty neat shop. It reminds me of something that would be in Hampden, Baltimore, which is a good thing -- neat clothes, quirky and funky gifts, some art, some prints, local neighborhood gifts, fun things for kids and a lot more. 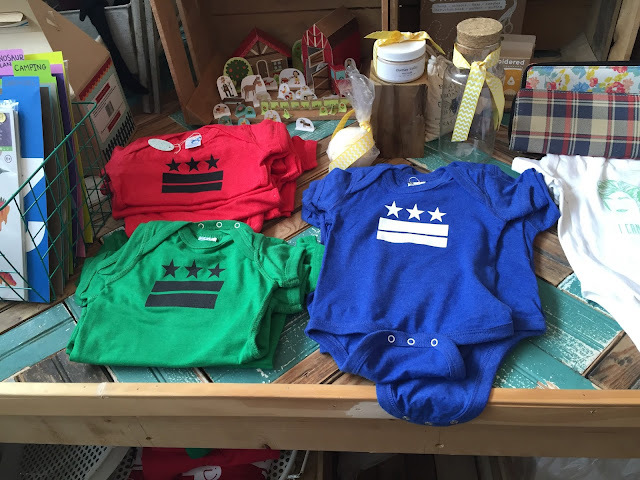 Their website and Facebook page focus on women's fashion (maybe that's easier to sell online), but inside that's only a portion -- I saw a lot of funny baby onesies and such, some coasters with DC neighborhood maps on them, various Petworth-related prints and shirts, and other funny things -- various screen printed t-shirts, games, crafts, toiletries, and as somebody on Yelp put it, cute things for your coffee table. I didn't take pictures of it, but there was also a lot of women's clothing like dresses, tops and such -- my bad, there are more examples on their website and Facebook. 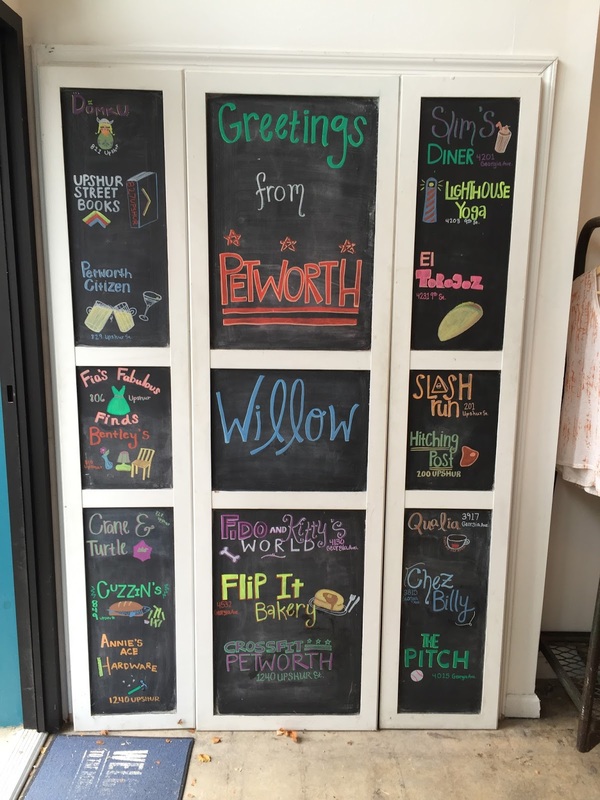 They also had a cool Petworth chalk mural-type thing with all the other Upshur Street businesses on there. Upshur is really growing into a cool little strip with restaurants, shops like Willow, Upshur Street Books, Bentley's Vintage, and more. And there's more coming -- Slim's Diner, the cocktail place Twisted Horn from the Hank's Oyster Bar folks, Timber Pizza Co., and more. It's a neat place to browse and would be great for gifts for Christmas, birthdays, babies, and so on. I wish there were more of these kinds of places around. Check it out. Chick-fil-A will open November 4 in DCUSA! Chicken alert: Chick-fil-A in the DCUSA shopping center will open November 4th, according to the Washington Business Journal. 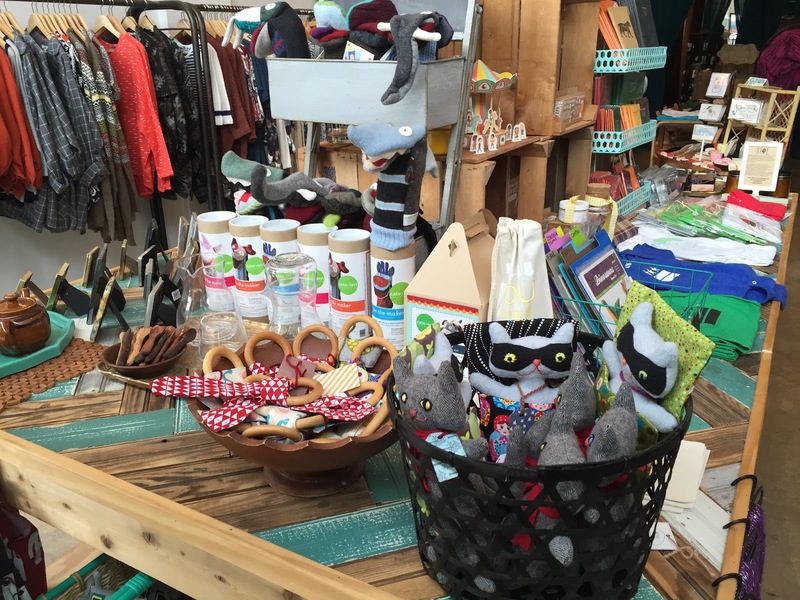 It's the first non-college location in the city and they are also thinking of opening other stores around town. The store is run by a local franchisee, Jessie Chesson, according to the article. The address is 3100 14th Street, in the space that used to be Lime Fresh Mex. Some argue that we should forgive Chick-fil-A anyway, and they have stopped donating to anti-gay marriage groups. What do you think? Waffle fries and chicken sandwiches, or no way? Last week I wrote about starting a new series called Weekday Lunch, where I check out local places where you can get lunch during the week -- maybe if you work from home, or are just around during the day. I wrote a little recap of a few options (The Coupe, Coffy Cafe, Shanghai Tokyo, DC Reynolds) and am now starting the series in earnest. I went to Small Fry last week, which was pretty tasty. 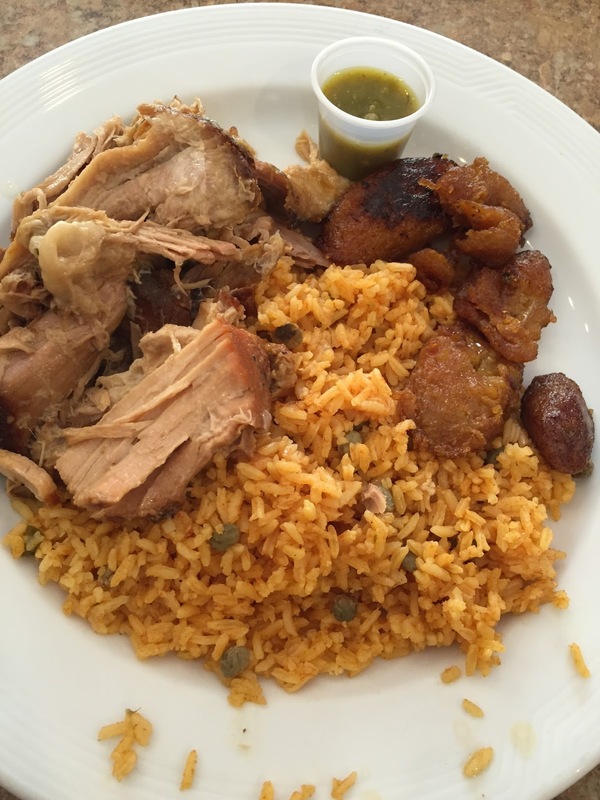 The next installment of the series is Los Hermanos, a Dominican restaurant at 1426 Park Road NW. It's a sit-down restaurant but with a buffet where you pick what you want, then they serve it for you, cafeteria style. 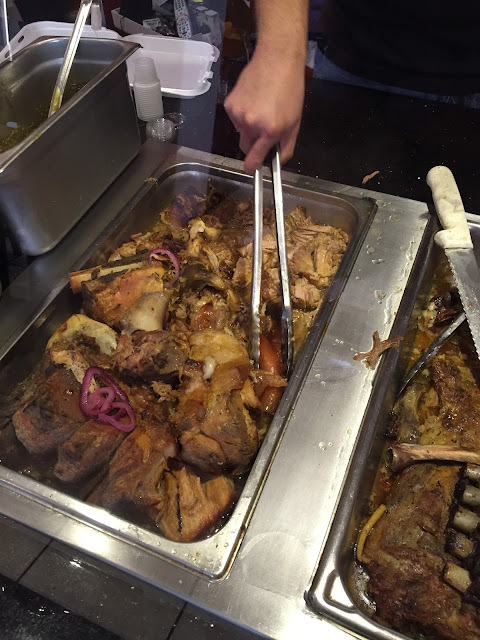 The friendly guy at the buffet went through the options: things like fish with coconut sauce, rotisserie chicken, pork, mofongo (a dish with plantains, veggies, and meat mashed together), oxtail, goat, stewed beef, bacalao (salted cod) and lots of other options, plus local soups that Yelpers like. Their menu has the full breakdown and helpfully explains what they were. I went with the chicken, and the guy gave me a big helping of leg (or I could have chosen breast) plus one or two sides. 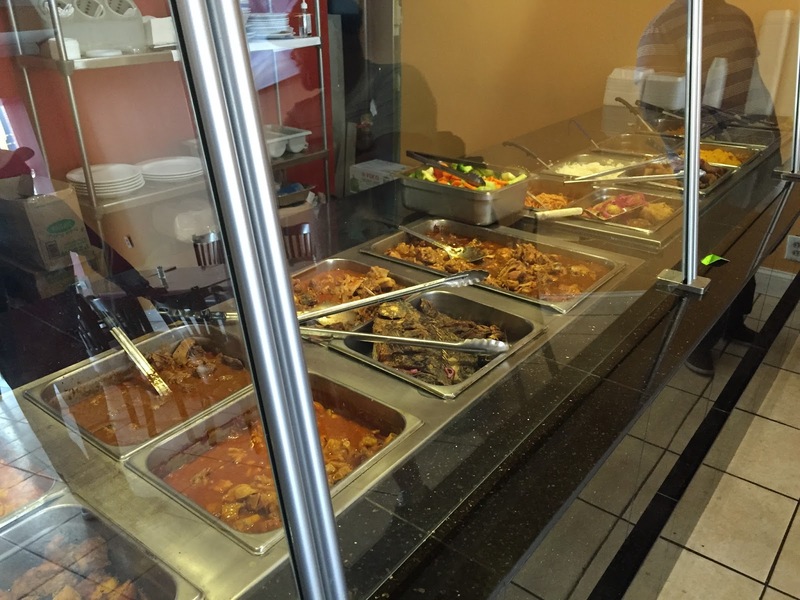 There are a bunch, I opted for plantains and rice with beans -- they have a few different rice and beans or peas options and other sides. Lunch with a drink (I got Inka cola, a Latin American kind of cream soda) ran me about $13, so not too expensive for a ton of food. And it was delicious -- the chicken was moist and tasty and the plantains and rice hit the spot. I would have liked a more for plantains, but it was tasty. The vibe inside was kind of a trip too -- there were some older men playing dice, an old guy yelling at the TV occasionally, and some good Latin music on the speakers. I'll definitely check it out again. 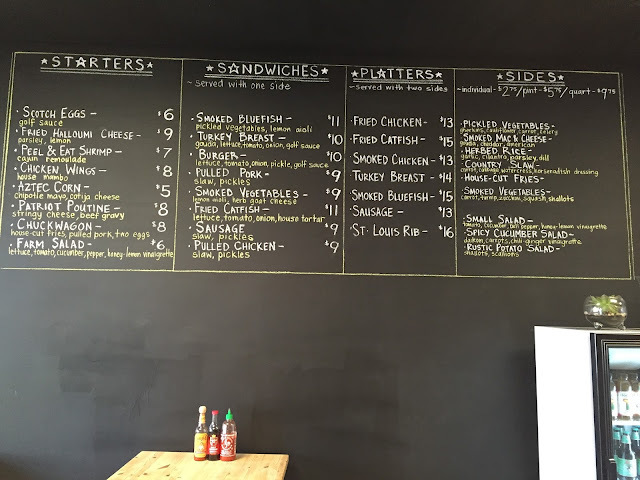 The other day I decided to head by Small Fry, the new barbecue spot at 3212 Georgia Avenue from the people behind the Sundevich sandwich shop and A&D bar, and it did not disappoint. They're going to be the companion restaurant to Union Drinkery, which is opening upstairs sometime in the future. I first wrote about Small Fry a couple of weeks ago. They advertise themselves as a smokehouse and fry shop, and there's a big menu -- starters like Scotch eggs, poutine, and fried haloumi cheese, plus sandwiches, platters and sides: slaw, smoked gouda mac and cheese, pickled or smoked veggies and more. The sandwiches come with one side, the platters with two. I'm looking forward to trying to smoked bluefish or smoked chicken platters next, plus definitely the scotch eggs and haloumi. I feel like this would be a good place to go with some friends and split lots of things. 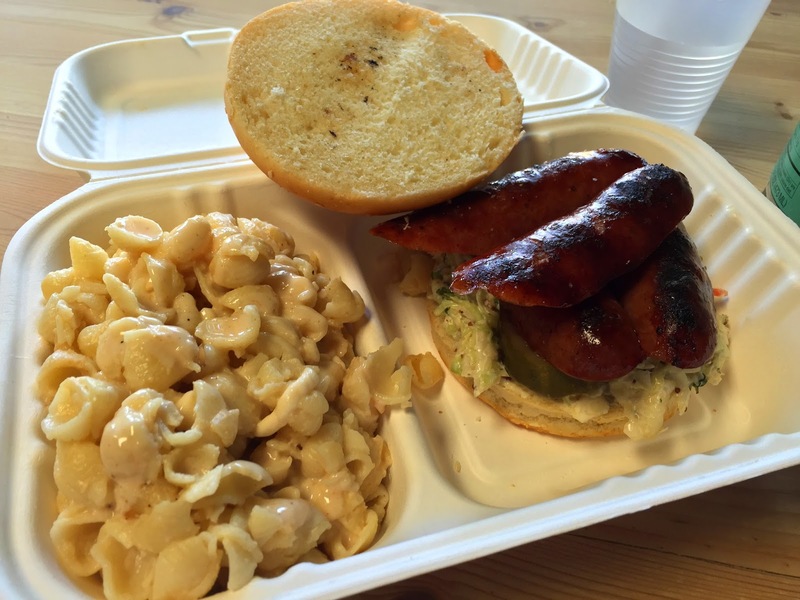 I'm a big fan of bbq sausage so I went with the sandwich and the mac and cheese, and both were really good. The sausage had good snap and a nice smoky flavor and was topped with slaw; the mac and cheese was killer -- very smoky and creamy. The bun was the weak spot, just kind of a blah piece of bread, but it was still quite good -- and you can't go wrong with $9 for a sandwich and side. It's a nice space inside too, big wood tables and two rooms, so plenty of room if it gets busy during lunch or dinner. The guy working was friendly as well. Definitely worth a visit, check them out! 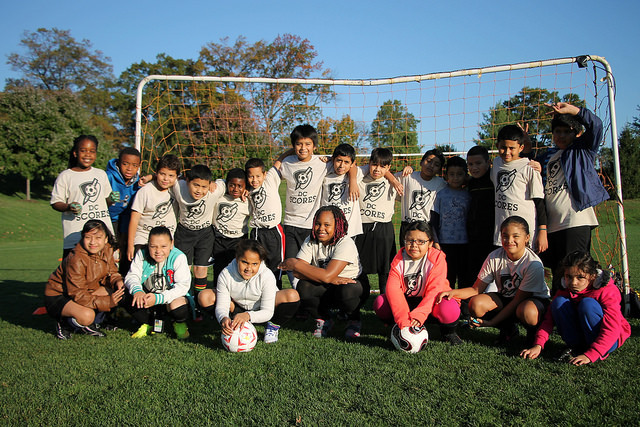 A couple of weeks ago I wrote about my new partnership with DC SCORES a great local nonprofit that runs after-school programs with poetry and soccer at 50 schools and rec centers around the city. They're always looking for volunteers, and this weekend is a great opportunity to help: it's their annual Fall Frenzy, where they celebrate DC SCORES participants and families. There's all kinds of shifts and things you can do, from helping set up, serve food, paint faces or even referee soccer games if you know a little bit about soccer. It's this Saturday, October 24 at Trinity Washington University (near Catholic U.) from 9:30am-2:30pm, and you can sign up here. 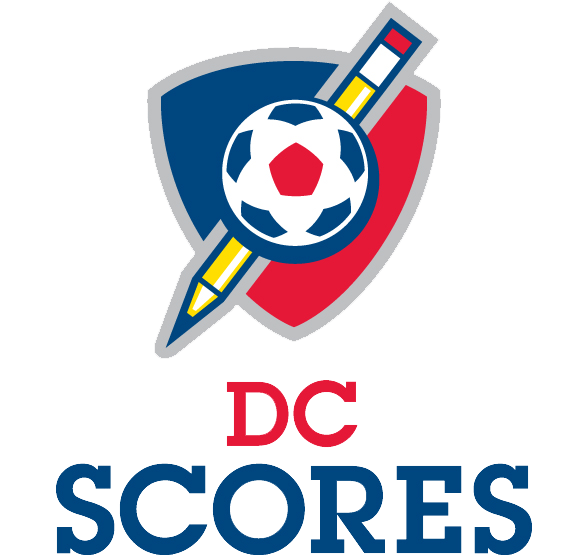 Here's more about the event and about DC SCORES. The DC SCORES Fall Frenzy is one of the premier events of the fall season bringing together families, community members, volunteers, and longtime supporters. 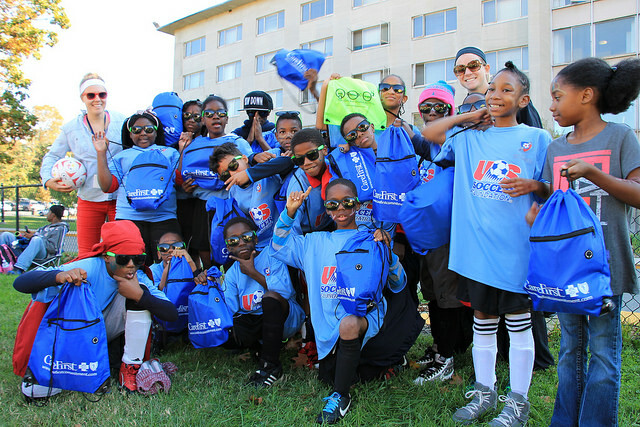 More than 800 students representing DC SCORES’ public and public charter elementary schools in seven of the District’s 8 wards compete in a round-robin soccer tournament while rotating between activities such as facepainting, fitness booths, relay races, a creative expression table and more. A couple of days ago I wrote about the dog costume contest at the 11th Street Halloween Carnival, which sounds like fun. 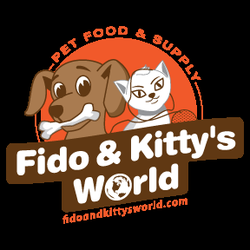 I just heard about another one, at Fido and Kitty's World, a pet store at 4130 Georgia Avenue NW. Here's more info. Sounds pretty funny. Winter is nearly upon us, which means it's a tough time for the region's homeless people. 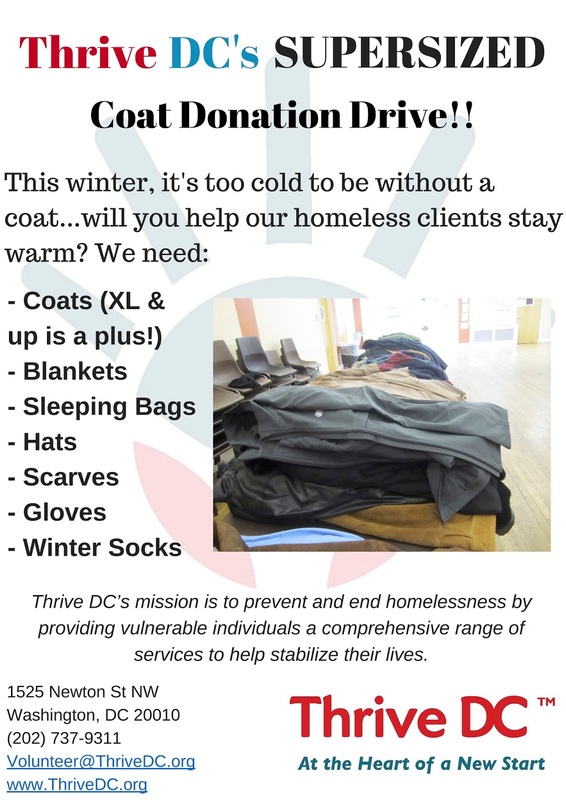 Thrive DC, a homeless services center based at St. Stephen's Church at 16th & Newton, is hosting a "Winter Warmth" clothing, coat and blanket drive to help. Just bring any of the items listed on the flyer to the church sometime before Nov. 2, or if you don't have any but want to help, you can buy items off their Amazon wish list. If you need a coat or warm clothes or know someone who does, Thrive DC is giving out the items they've collected on the first Friday in November (Nov 5th), the first Friday in December (Dec 4th), and the second Friday in January (Jan 8th) starting at 8:30 AM on a first come, first served basis. Last winter, 2014 – 2015, was cold! We lost three friends to weather, illness, and harsh living. This is why your help is so crucial. We need your gently used or last season’s winter clothing the week before each of these distribution dates. If you would like to help, but do not have any used items to donate, please consider purchasing items off our Amazon Wish List. If you have questions, please contact our Volunteer and Community Relations Coordinator at volunteer@thrivedc.org or (202) 503-1528. These are things we always need, but each week presents a new shortage and an opportunity to make an impact where we need it the most. If you want to know what we need NOW, please consider joining our Rapid Response Team! We serve over 130,000 meals a year, are one of only six places in DC to offer free showers and laundry outside of a shelter, and have a variety of programs for employment, substance abuse, and individuals transitioning out of prison. Halloween is coming: where do kids trick or treat in our neighborhood? Halloween is coming soon, which means trick or treaters, and I recently got a few questions about trick or treating -- namely, where do kids trick or treat door to door, and do they trick or treat in apartment buildings? 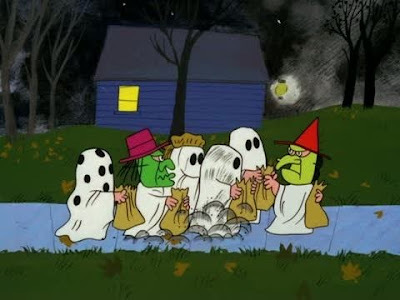 I've seen a pretty good amount of kids trick or treating at houses along Spring Road, 13th Street and 11th Street -- are there any other streets where you see them, or don't see them? I'm not sure about apartment and condo buildings, however -- anybody have any ideas about that? Do kids go from apartment to apartment where you live? I would bet that some buildings do organized events. There's also the organized 11th Street Halloween Carnival, which includes ttrick or treating, costume contests for kids and dogs, and more. It's at the Trolley Turnaround Park (11th and Monroe), hosted by the CoHi Initiative, North Columbia Heights Civic Associations and local businesses. It runs from 3 to 7:30 pm on Oct. 31 and is free. Here's more info. And make sure to follow the Halloween customs: turn your outside light off if you don't have candy and don't give away raisins, pennies, toothbrushes or other lame stuff like that. 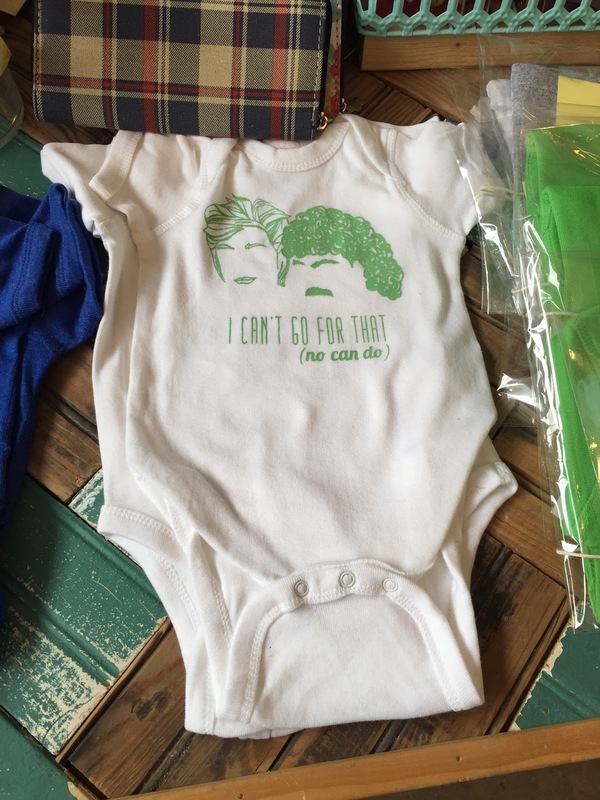 You don't want to the be the subject of those kids' bad Halloween stories for years to come. If you have electronics you need to recycle, or other things like cooking oil, pesticides, batteries and so on, or personal documents you want shredded, the city is hosting recycling on Thursdays and Saturdays at the Fort Totten Transfer Station near Catholic U. Check www.dpw.dc.gov for 2015 drop-off, document shredding schedules. 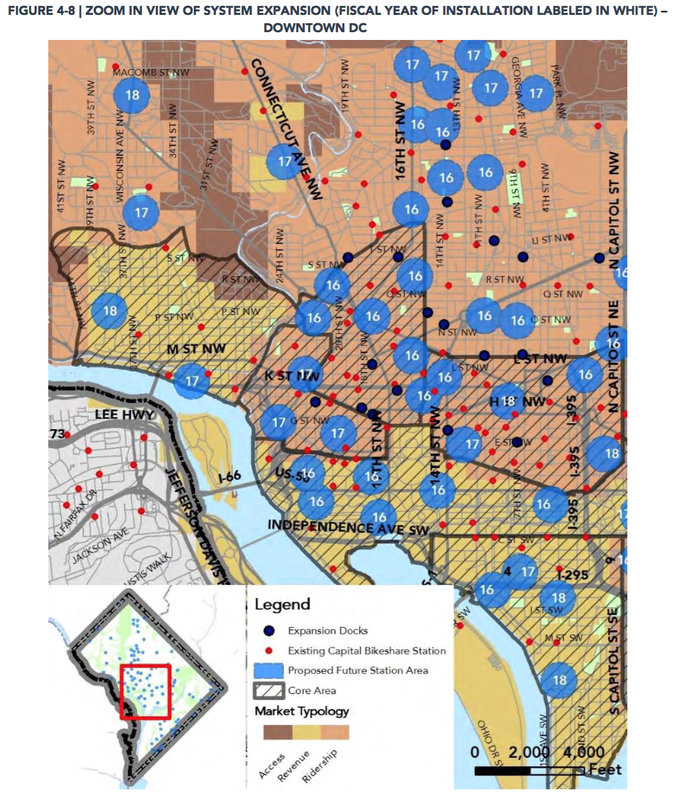 (Washington, DC) The DC Department of Public Works announced today the November 2015 schedule for disposing of household hazard waste, e-cycling and personal documents for shredding at the Fort Totten Transfer Station*. Weekly, Saturday HHW and e-cycling drop-off schedule: November 7, 14, 21, and 28 between 8 am and 3 pm. Monthly, weekday HHW and e-cycling drop-off: Thursday, November 5. Every month, weather permitting, DPW will accept HHW and e-cycling the Thursday before the first Saturday between 1 pm and 5 pm. Monthly, Saturday personal document shredding is November 7 between 8 am and 3 pm. DPW will accept personal documents for shredding the first Saturday of the month only. District residents may bring HHW items such as cooking oil, pesticides, pet flea control and cleaning fluids to Fort Totten, along with e-cycling items such as computers, televisions and other unwanted electronic equipment. For a list of all household hazardous waste and e-cyclables accepted by DPW, please click on this link www.dpw.dc.gov and navigate to Household Hazardous Waste Drop-off. DPW does not accept latex paint, which can be disposed of in the trash. Paint must be dried out by adding an absorbent, such as kitty litter or sawdust, to it before it goes in the trash. 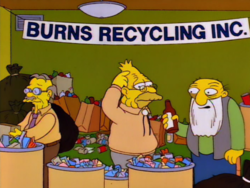 On the first Saturday of the month only, residents may bring up to five boxes of personal documents to be shredded. No business or commercial material will be accepted. Personal documents to be shredded will be accepted only on the first Saturday (except holidays) because these documents cannot be protected until the shredding contractor arrives on the first Saturday of the month. New Columbia Heights is partnering with DC SCORES youth program -- you can help too! This afternoon I am happy to announce my participation in a collaboration that will bring new, engaging, and exciting content to the site: Bloggers United for DC SCORES. I am teaming up with Tiffani Nicole Johnson of the Brightwoodian and Drew Schneider of Petworth News to bring to you stories of the kids, families and difference-makers in the Columbia Heights community. This will be done through me writing original content as well as receiving content from DC SCORES, which runs after-school programs at 50 sites throughout Washington, DC, including schools and recreation centers in our area: Tubman Elementary School, Lincoln Middle School, Chavez Prep Charter School, Raymond Education Campus, and Parkview Recreation Center. DC SCORES tackles the many very real impacts of a life of poverty on a child -- a lack of extracurricular enrichment, a lack of adult mentors, and a lack of fitness opportunities -- in an innovative program that combines soccer, poetry and creative expression, and service-learning during the after-school hours every day. 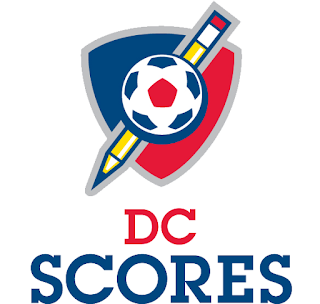 If you walk around the neighborhood during the evening, there is a good chance you’ll see a child or parent wearing a “DC SCORES” shirt. 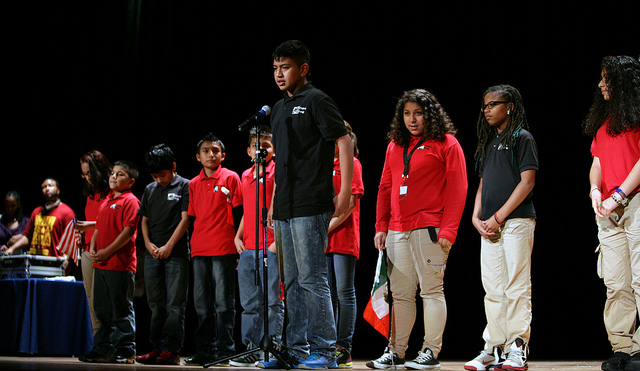 The program has changed the lives of more than 9,000 DC children since 1994. The coaching is done primarily by teachers at the schools, creating a bond and trust between kids and adults that translates to the school day. I will bring their stories to you, too. My hope with this series is to bring our community even closer together, and make it feel welcoming to all. 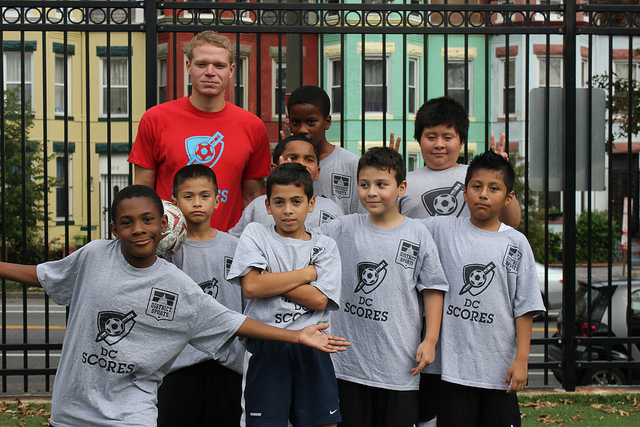 DC SCORES has a proven history of building not just cohesive teams of children, but communities as well. By highlighting these stories through words, photos and video, I’m confident you’ll become closer with your neighbors, feel more connected to the schools, and simply feel good about where we live. And maybe you'll want to help out this great organization too! Wangari Gardens hosts Fall Festival Oct. 18: gardening demos, food, music, games for kids, a lot more! 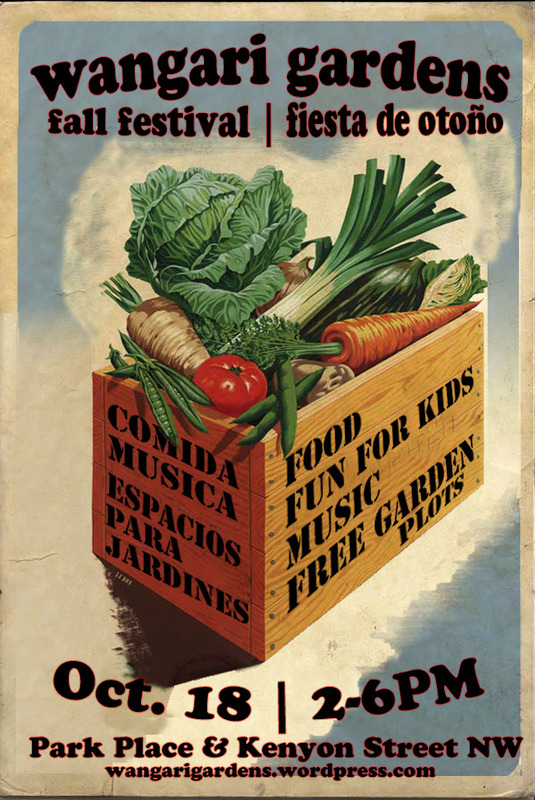 Wangari Gardens, the cool community garden in our area, is hosting their Fall Festival on October 18th, with food, music, fun for kids, gardening demonstrations, prizes and a lot more. You can also learn about helping out or getting your own free garden plot. Read on for more! Wangari Gardens fall festival – October 18, 2015 from 2 to 6 PM! There’s a nip in the air, the leaves are turning, and it’s to get your last harvest in before winter! To celebrate the end of the season, we are having a fall festival at wangari gardens, park place and kenyon street NW. RSVP here. Food and games for kids including a moonbounce and face painting! Music by local 20s jazz band, the Foggy Bottom Whomp-Stompers! Come out and invite all your friends! 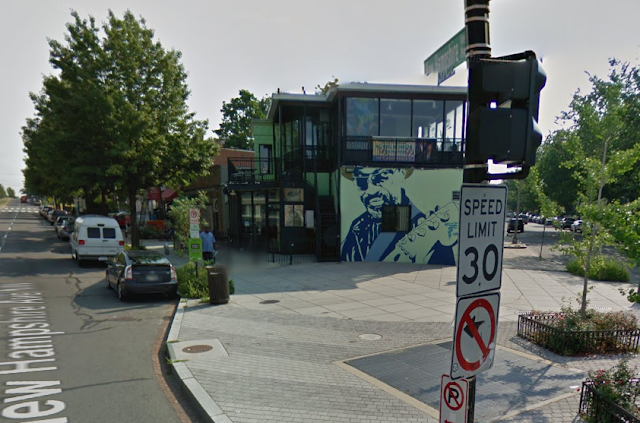 A few months ago we heard that Sweet Mango Cafe, the Jamaican restaurant at 3701 New Hampshire Ave NW (at the corner of Georgia) had closed and was sold at foreclosure, to be replaced by a residential building. The restaurant has been temporarily been replaced by Jerk Station, and now they have filed official plans for the redevelopment. 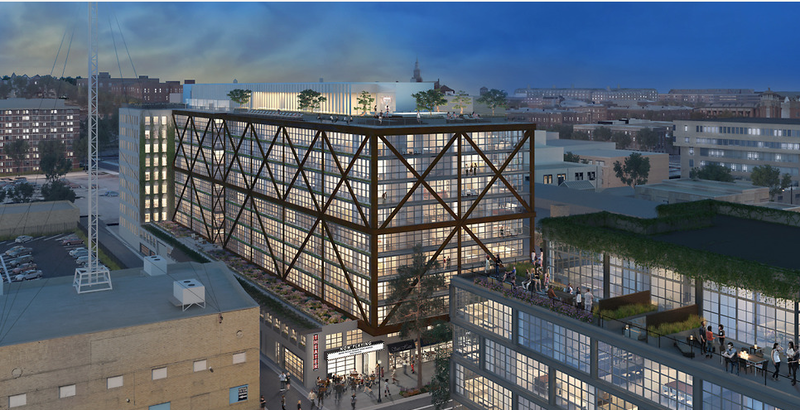 The DC Register, the official list of DC government action, reports that the building will have 21 residential units, ground floor retail, and can be up to 70 feet tall. Rooney Properties is working on the building, and there will be a hearing about it on November 17th. Let's hope there something good goes into the retail space underneath. That also means the neat Chuck Brown mural on the building might be removed, though Rooney told the Post they want to keep it. 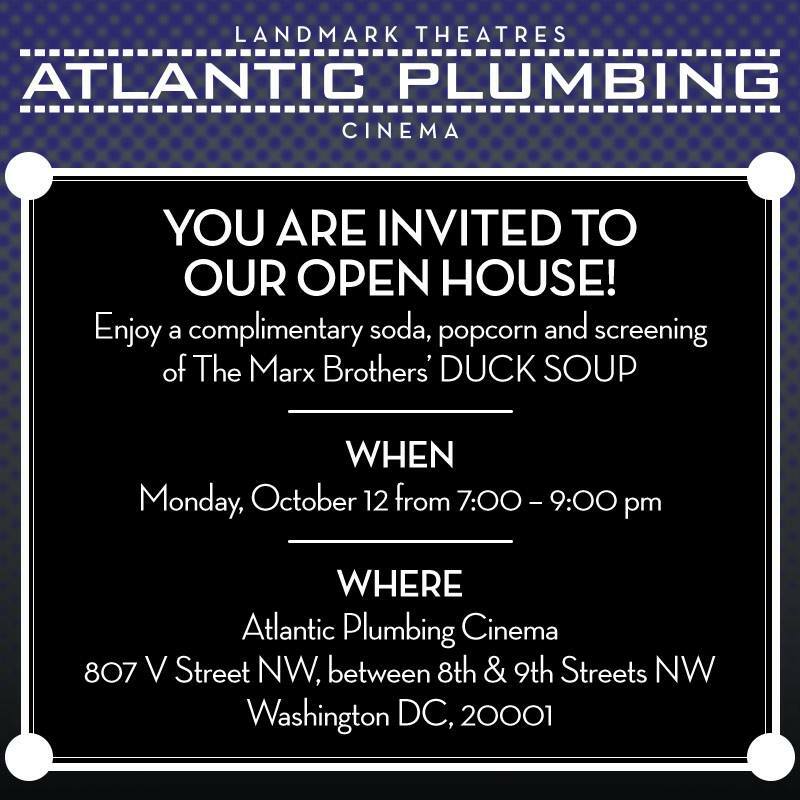 Not quite in our neighborhood, but nearby and pretty cool: Landmark Cinemas, who run the E Street Cinema downtown, are opening a movie theater Oct. 15 in the new Atlantic Plumbing building at 807 V Street NW. The theater will be nice, with leather seats, reclaimed wood, Dolby surround sound and such, and will have food and alcohol like at E Street. DCist calls it "fancy-pants." 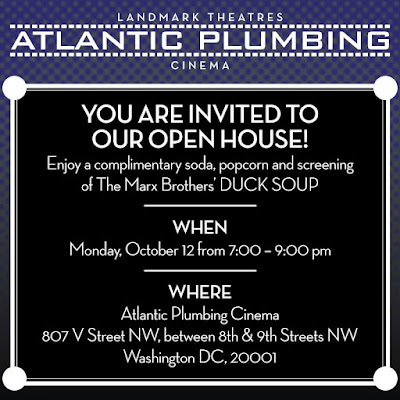 They're hosting a free open house on Monday, October 12, where they'll have free popcorn and soda and will be showing the Marx Brothers movie Duck Soup. The theater will open for regular business at 8 pm on Oct. 15, and Steve Jobs will be the first movie. The theater's Facebook page is here. Atlantic Plumbing is a new complex with retail, restaurants and condos (including a Warby Parker store) -- and kind of looks like a milk crate to me. That area is really blowing up lately with new buildings, and there's also a Whole Foods planned for nearby. One of my buddies has a theory that all these fancy new buildings mean that the 9:30 Club's days are numbered, but I hope that's not the case. Good news for Capital Bikeshare users: the District's Department of Transportation and CaBi will be expanding some existing stations in our area and adding more over the next few years, they recently announced. On their website, maps show about ten to twelve new stations in Columbia Heights, Park View and southern Petworth, and that means a ton more bikes in our area. 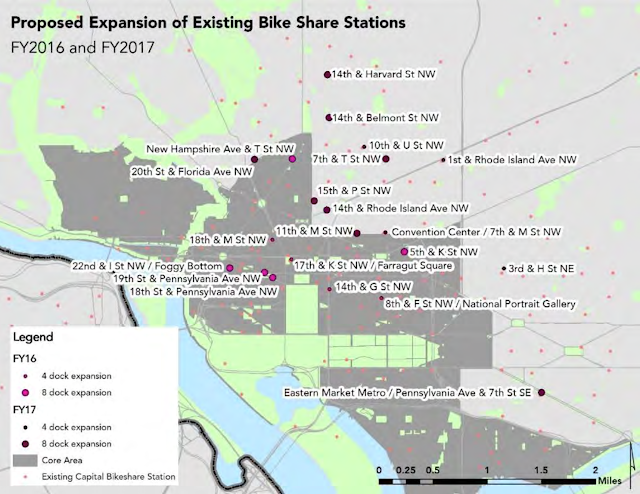 It's a little hard to tell, but from north to south, the new stations coming in 2017 are roughly are at 14th and Randolph, 14th and Spring, 16th and Newton, 14th and Newton, Sherman and Park and Warder and Lamont, while new stations coming in 2016 are 16th and Irving, 14th and Irving, 14th and Euclid, 11th and Euclid and 16th and Belmont. There are also plans to increase the size of existing stations at 14th and Harvard, 14th and Belmont, and 10th and U. They're taking comments until Nov. 10, so if you like the ideas or have concerns, let them know! The maps are below, with more detailed locations for new stations and existing stations. 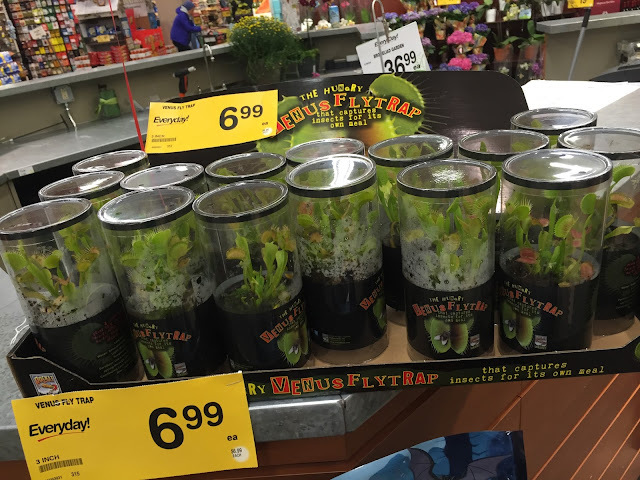 Well, this isn't something I expected to see at Safeway -- there's a big display of Venus flytraps, the carnivorous plants that eat bugs. Pretty wild. 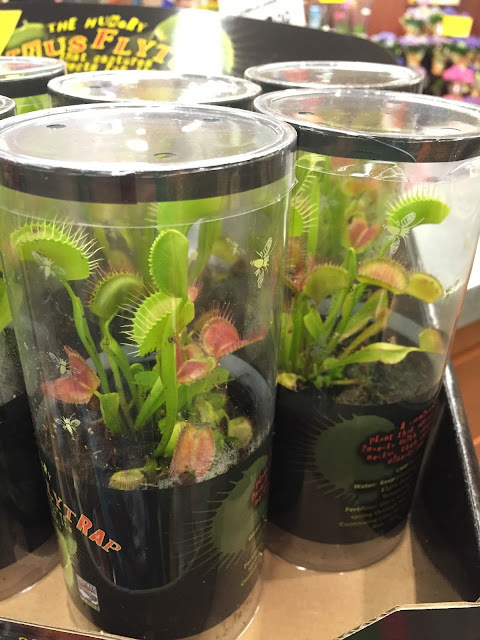 They're $6.99, which is not cheap, and are pretty small, but they're definitely a conversation piece. I got one and have yet to catch a bug, even though I've been putting it around where I see gnats and mosquitos and such. Still, pretty neat. Do you like maps? Do you like walking around your neighborhood? Do you like learning new things and helping people? 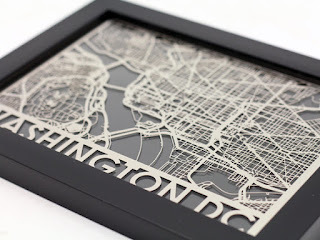 If so, there's an event for you on Saturday: Let's Map Columbia Heights, Petworth and Park View, from 12:30 to 4:30 pm at the Petworth Library. What is all this? There's great website called OpenStreetMap.org, which is a free, editable and open map of the world -- think Wikipedia but for maps. It's been used lately in Chile and Nepal after the earthquakes, the Philippines after Typhoon Haiyan, in West Africa during the Ebola crisis, and much more. 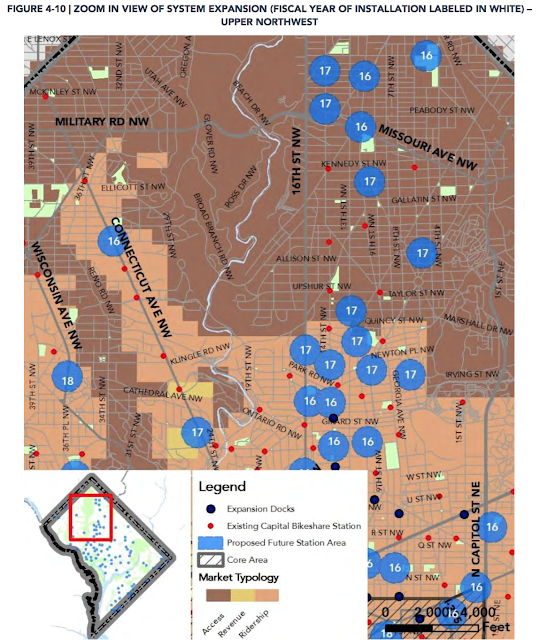 DC has its own OpenStreetMap user group, MappingDC, and we've organized a "mapathon" for Columbia Heights, Park View and southern Petworth, which are all lacking some businesses, offices and other points of interest. I did a project last year working with local kids to map out Georgia Avenue on OpenStreetMap, but now we need to do the rest. You don't need any special skills and it's easy to learn -- just come to the Petworth Library between 12:30 and 4:30 pm on Saturday the 10th, and we'll give you some paper maps of a few blocks and you just walk around and add details, like name and type of building or business, the address, operating hours and so on. 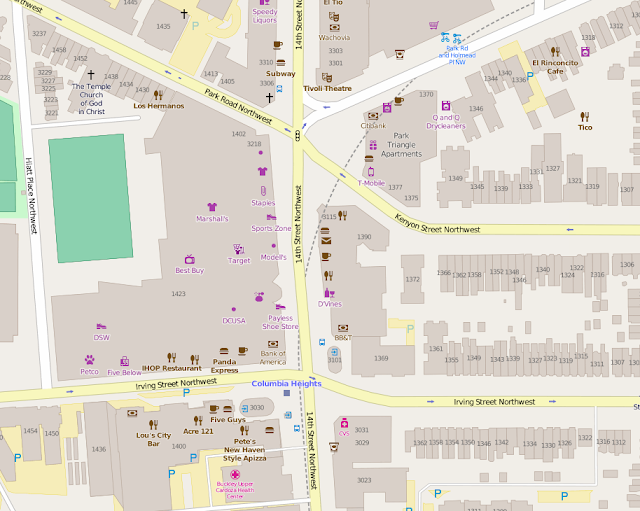 Then come back to the library and we'll help you add the data you collected to OpenStreetMap. It's a fun way to get out around the neighborhood and learn some fun new skills. 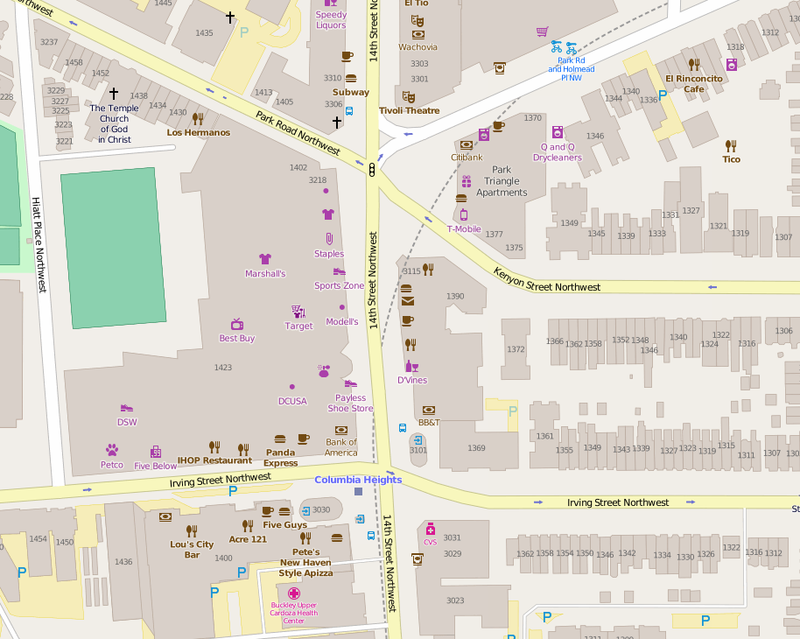 The Columbia Heights and southern Petworth neighborhoods (and neighboring Park View) are lacking a lot of businesses and other important places, so let's get them on the map! And there's a lot of new development too. We'll be walking around and putting things on the map, so it'll be a nice opportunity to get outside and explore a bit. Wear good walking shoes! And bring a friend! 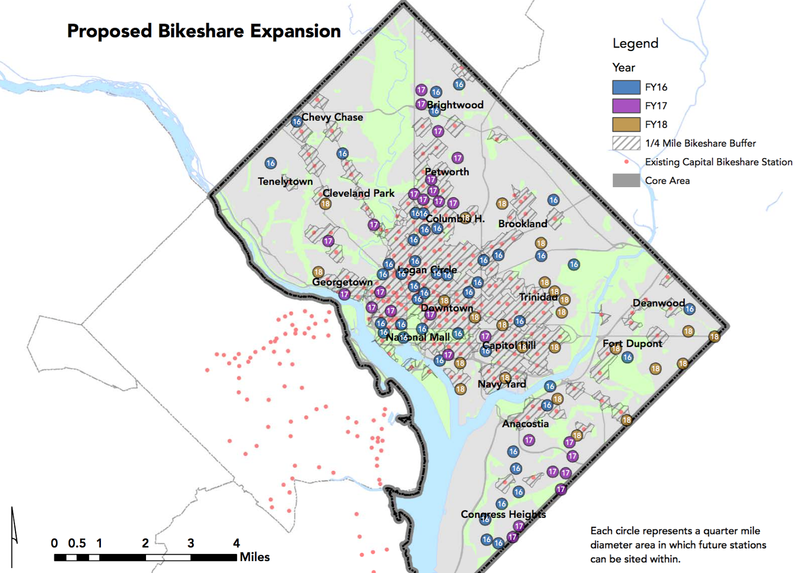 We're meeting at the Petworth Public Library, which is a couple blocks from the Georgia Ave-Petworth Metro (green/yellow) and close to a lot of buses and Bikeshare too. There's also lots of good coffee, lunch and bar options nearby, so might be a fun way to see a new neighborhood if you haven't been! Oh man, I am excited for some BBQ. Park View DC reports that Small Fry, a new barbecue and fries concept from the folks behind the delicious Sundevich sandwich shop in Shaw, is now open. 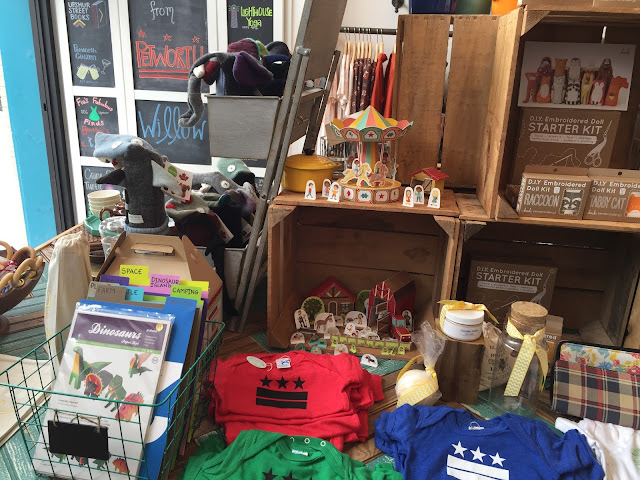 They're at 3212 Georgia, just up from Kenyon and next to Petworth Liquors. This is next to the coming Union Drinkery bar we heard about a while ago, and Small Fry is presumably one of the "fast casual" places that were opening in collaboration with the bar. I'm still looking for details on hours, what the second fast casual place is, and more. Here's their logo. UPDATE: They are open every day but Sunday, noon to 9 pm. 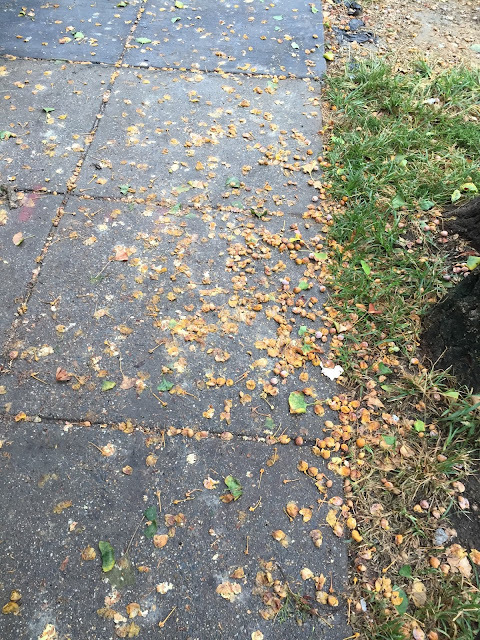 If you like things that smell like poop, this is your time of the year: the ginkgo trees are dropping their seed pods, which means stinky, sticky sludge on sidewalks in the neighborhood. I noticed a few the other day on Spring Road, and with the cold weather, there will be many more soon. I dread the thought. The odor sticks to shoes and bike tires and smells like feces or vomit or very bad milk. Not fun. Thank the butyric acid inside. The city's Urban Forestry Administration actually will spray the female trees, which drop the seeds, to stop them from dropping, as well as remove them from a whole block in some cases. The city will replace a whole block's worth of ginkgo trees for free, but there are some requirements first: you have to get 60% of the property owners on the block to agree, as well as the local Advisory Neighborhood Commission. Seems like a good deal, though maybe not the easiest to accomplish. Their site has a petition and such you can use. If I had a whole bunch on my block, however, I definitely would start to process. This is pretty cool: local radio station 106.7 the Fan will be broadcasting Redskins great and NFL Hall of Famer John Riggins and radio personality Chad Dukes live from Lou's City Bar the next three Mondays, starting today the 5th. They'll be hosting their sports talk show from 2pm to 7:45 pm, with 1/2 price burgers until 7 pm, plus deals on New Amsterdam vodka drinks, Monday Night Football trivia and more. Seems like a cool opportunity to meet a famous Skins player from the past in our neighborhood. Riggins is a Hall of Famer with historic seasons for the team and the Jets before that, and was a hero in the playoffs and Super Bowl XVII. 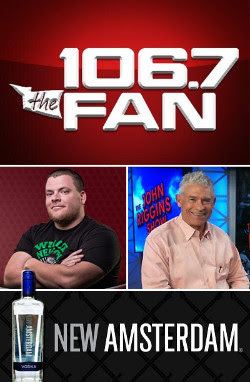 Chad Dukes, John Riggins, and 106.7 The Fan are broadcasting LIVE from Lou's on Mondays starting this week! Join us Oct 5th, 12th & 19th from 2-7:45pm as Chad and Hall of Fame Redskin John Riggins talk sports leading up to Monday Night Football. We'll have 1/2 price burgers all day until 7pm, specials on New Amsterdam Vodka all night, and our new MNF Trivia Blitz with prizes for predicting TDs, sacks, scores and more plus Sports ‪Trivia‬ at halftime! I've been to the Airedale, the awesome new European gastropub at 14th and Spring a few times, but had not yet tried their whiskey soft serve. I was there the other day and gave it a shot, and it was amazing. It's my new favorite food in the neighborhood, maybe in the whole city. You should go get it right now. 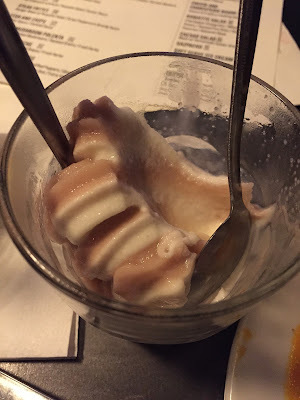 The Airedale folks mix Old Overholt rye in the vanilla soft serve mix so a serving is the equivalent of an ounce of booze, and they just recently started making an Angostura bitters flavor as well -- and since it's a soft serve machine, you can do a swirl of them both. The rest of the food is really good too -- on a recent visit my buddy got the fish and chips, which were perfectly fried: light, airy and crispy, with a lot of good fish and fries. I tried the currywurst, which is two sausages covered in a German curry sauce with fries. It was tasty and I had plenty to take home to eat for lunch the next day. They have a lot of other good hearty European food too, like a Monte Cristo sandwich, schnitzel, brats, and some vegetarian options too. The Airedale also recently opened their patio, which is nice. If you haven't been to their Airedale, go check it out, and get the soft serve swirl. The Airedale is at 3605 14th Street NW. Here's their website.